Toyota is working to make public transportation more convenient and accessible to residents of Grenoble France, launching an electric car initiative that provides a last-mile solution to commuters. If successful, the program could have wide implications for the transportation industry, particularly in forward-looking U.S. states like California. In the near future, California residents could see more electric cars for sale in Los Angeles and other major cities as a result. The Grenoble project is a three-year program aimed at changing how people plan and complete journeys in their local area. Toyota is supplying about 70 electric vehicles and its Ha:Mo (harmonious mobility) management system to the city, applying a successful model it has already piloted in Toyota City, Japan. One of the major drawbacks of public transportation is the distance between people’s homes or destinations and transportation hubs. 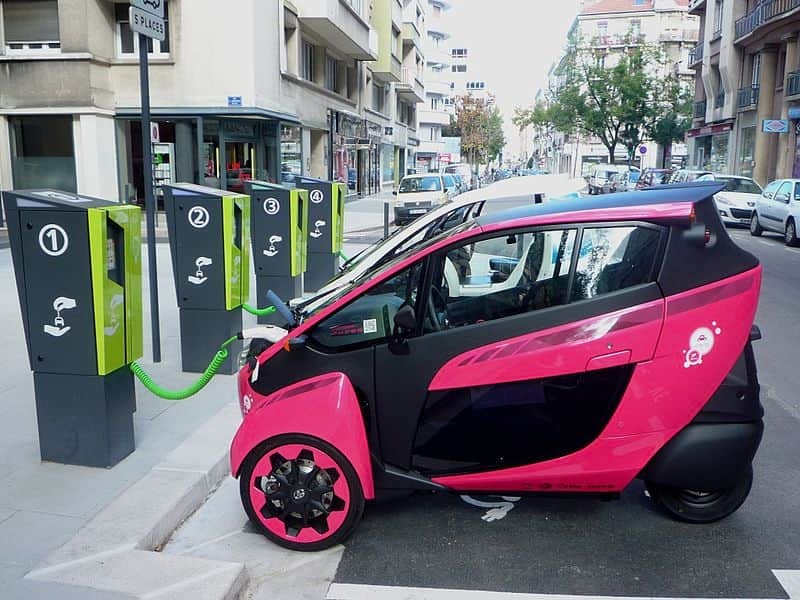 The Toyota Grenoble project will work to shorten that distance by placing electric cars residents can borrow at strategic neighborhoods and other points in the city. Residents will be able to hop in one of the electric cars and drive it from the local stations to larger transportation hubs and vice versa. The program allows anyone over the age of 18 with a valid driver’s license to register with Cité Lib, a local car sharing service. Once they’re signed up, they will be able to download an app to their smartphone, computer, or tablet that will let them see the availability of charged electric cars in the program ready to use. People registered with Cité Lib will be able to pick up an electric car and drop it off in one of 27 charging stations in metro Grenoble. When dropped off, the vehicle will be charged and prepared for the next user. The point of the program is to create a more practical and useful public transport system. By allowing people to use electric vehicles with stations in their neighborhoods or business districts, getting to and from transportation hubs is much easier and convenient. Toyota has provided 70 vehicles for the Grenoble program, including 35 three-wheel Toyota i-ROADs and 35 four-wheel Toyota Auto Body COMS. The three-wheel i-ROAD was first introduced to the public at the March 2013 Geneva Motor Show. The vehicle is powered by a lithium-ion battery and has a 2.7 horsepower engine. It can plug into common household outlets and has a range of about 31 miles. Its top speed is 28 mph. The vehicle is about three feet wide and seats two passengers in an enclosed cabin. The vehicle steers like a skier, and uses “Active Lean” technology to create a smooth ride and stabilize the vehicle. The four-wheel Toyota Auto Body COMS seats one person and has a small storage compartment. The COMS has a maximum speed of about 30 mph and a range of about 31 miles. If the Grenoble project works, more cities and private individuals may invest in electric cars. The day may not be too far in the future that electric vehicles are more prevalent among cars for sale in Los Angeles at dealers like North Hollywood Toyota. The broad vehicle market is still somewhat apprehensive concerning electric vehicles. A recent survey in the United Kingdom shows that 40 percent of respondents had concerns about recharging the vehicles, 39 percent were concerned about range, and 33 percent thought the vehicles were too expensive. Successful programs like the Grenoble project may help change minds. In addition to making taking public transit more practical for Grenoble area residents, the program also is helping the environment, as the vehicles are low-carbon, meaning their power source uses less energy derived from carbon-emitting substances than other vehicles. Carbon pollution has been identified as a key driver of climate change by a consensus of the scientific community. Years of research backs the assertion that, if left unchecked, carbon emissions in the atmosphere could wreak severe ecological damage around the globe, causing famines and species extinctions. Recently China and the United States announced goals for reducing carbon emissions. The U.S. has pledged to reduce carbon emissions by 26 to 28 percent of 2005 levels by 2025. China has agreed to targets for its peak carbon emissions. Located in southern France near the foot of the Alps, Grenoble is a city of about 156,000 residents. The city’s metro area contains about 664,000 residents. Grenoble has been inhabited for nearly 2,000 years, with settlements going back to Roman times. Since holding the X Olympic Winter Games in 1968, Grenoble has become a significant science center in Europe. Many tech companies have a significant presence in Grenoble, including Hewlett-Packard and several semi-conductor manufacturers. Toyota’s experiment in electric vehicles and vehicle sharing is representative of the area’s embrace of technology and innovation. It’s not a far reach to expect that progressive communities in California will soon also launch similar experiments, and that soon there will be electric cars for sale in Los Angeles.